Mohammed Hammad top scored for Barnack against Oundle. Barnack stretched their lead at the top of Rutland Division One yesterday (July 1). The villagers have been fortunate with the fixture scheduling as for the second successive Sunday they met an effective second string. It was Oundle yesterday whose first team were briefly involved in Finals Day at the Northants T20 Championship. Matthew Kidd took seven wickets for Bourne against Weldon. Oundle’s reserves mustered 138, a total Barnack passed quickly enough to ensure a maximum 20-points return. Star men for Barnack were A. Majeed (4-41), Amir Munir (3-24), Mohammed Hammad (35), Umair Mirza (30no) and Ajax Akhtar (30). Barnack received a bonus boost with a first league defeat of the season for Ketton Sports at home to King’s Keys, the team rooted to the bottom of the table thanks to a points deduction. Ketton were complimentary towards their opponents, but less towards some umpiring decisions. 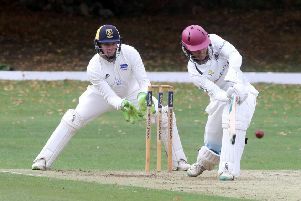 The home side were despatched for just 125 on their way to a four-wicket reverse. Shazhad Amir (4-36) and Zaheer Abbas (3-48) were Keys’ stars with the ball before a half century opening stand between Usman Sadiq and Danny Ashraf put the result beyond doubt. Ketton travel to Barnack next Sunday (July 9). Barnack’s only defeat of the season came in the first game of the season at Ketton. Bourne have slipped into second place after smashing Weldon by 166 runs. Quewin O’Connor cracked a century and Rob Bentley made 71 in Bourne’s 275 before Matthew Kidd’s 7-48 helped skittle Weldon for just 109. Reigning champions Wisbech were also huge winners as they humbled Grantham by 238 runs at Harecroft Road. Rhys Howell bashed 121 of Wisbech’s 292-7 putting on 124 for the fourth wicket with Cambs captain James Williams (64) after the home side had slumped to 11-3. Brodie Ellis (6-15) did most of the damage with the ball as Grantham were skittled for 54 in reply. Oundle 138 (L. Fresen 32, P. Wilson 29, L. North-Row 22, A. Majeed 4-41, A. Munir 3-24, A. Akhtar 2-46). Barnack 140-2 (M. Hammad 35, U. Mirza 30no, A. Akhtar 30, Y. Mirza 25no). Ketton Sports 125 (W. Compton 22, S. Amir 4-36, Z. Abbas 3-48). King’s Keys 126-6 (U. Sadiq 28, D. Ashraf 28, T. Aziz 2-8, W. Compton 2-36). Bourne 275 (Q. O’Connor 102, R. Bentley 71, S. Harby 36, J. Temple 26, Z. Gillies 4-22). Weldon 109 (S. Milson 42, M. Kidd 7-48, P. Morgan 3-41). Wisbech 292-7 (R. Howell 121, J. Williams 64, G. Freear 57no, D. Freeman 4-67). Grantham 54 (B. Ellis 6-15, K. Haynes 3-33).